Well, it didn’t matter that we have bought thousands of dollars in server and computer hardware in the past few years, or that the address was 1 suite number down the hall, or that I actually called them. They would only ship to a confirmed address which lost them my order and possibly my future business. This cost them $10, and they probably lose 20 more orders from me over the next 5 years. An example of really good customer service. Even so, they decided to replace it for free and they didn’t require me to send back the broken one. This is what I call above and beyond customer service, and it’s guaranteed that next time I need something for one of my aquariums, they’re the first place I’ll stop. This cost them $10, and they probably get 20 more orders from me over the next 5 years. These are polar examples of a very important concept… Your existing customers are not and should not be treated like a your new ones! It’s a well accepted principal in marketing and business in general, that your existing customer is easier and cheaper to sell to than a new customer. Additionally for ecommerce, selling to your existing customer poses a significantly lesser security and fraud risk than any new customer, especially in a case like this where the customer has placed several orders over several years. If you want to create a remarkable online business, create the best experience for new customers, and make it even better, easier, and more efficient, for repeat customers. There’s no reason to assume all customers should be treated the same. The majority of shoppers only place one or two orders with a website (Unless we’re talking about someone like Amazon). For this reason, you should make it as easy as possible for repeat customers to order from you, and you should give first time shoppers reasons to come back. It’s significantly cheaper to entice an existing customer to make another purchase than to go out and find a new customer. If you think you’re significant enough that most of you shoppers wont go somewhere else if the price or service is much better, think again. One thing i wanted to add was that in recession customers (even the repeated ones) get choosier and sensitive. It is therefore very important to not only retain but also expand the customer base. I think part of the blame for the first problem can be placed on Paypal. They have very restrictive policies for covering payment problems and one of them requires shipping to a confirmed address. If someone ships to an unconfirmed address, they receive no Paypal protection for it. Now, the company could override this for a repeat customer, but I find I can’t fault them for complying with the policies of their payment service provider. As Tula states, the issues regarding payments received via paypal always puts online sellers on their back foot. There are so many instances where e commerce stores can lose money when using paypal you can’t really blame one for being extra meticulus (even if it was for a $10 sale). Fair play to the online retailer in your second example, a good example of customer service. The subject “your repeat customer better” is the most important subject in regard to the Business Development opportunities. Now We need to analyze what strategies we need to adopted to get the potential customer on our website and the customer will become our repeating customer. Nice article, and some good points. It’s very true that word of bad customer service spreads much further than that of good service. Customer Service is very important, even some of the bad customers you need to treat good, as word of mouth can be damaging to buisness, the ” customer is always right” attitude is i think crucial for any successfull buisness. Hey first thnaks for sharing the article. Really the word of bad customer service spreads much further than that of good services. This is an interesting post, mostly true. i think that, any company should make their each and every customer feel that they are one and only one customer of the company. it doesnt matter new or repeat. Agreed. Not enough online retailers focus on their current customers. Too bad because that’s where all the profit is. I’l like to add to this conversation the concept that not all current customers are created equal. 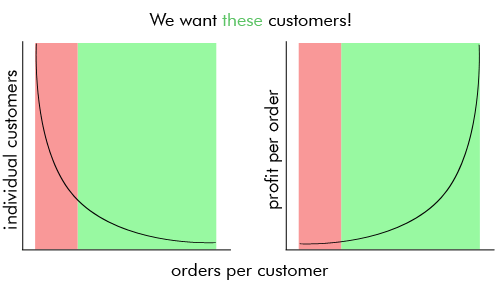 So, if you are to focus on driving repeat business, then make sure you’re focused on the best customers (best lifetime value or affulent) vs. a broad approach to go after all repeat customers. I think you are absolutely right. Repeating customers will trust transactions however you should always develop your site with usability and security in mind. Studies show that over 70% of visitors that leave with no transaction left because of failed checkout pages or they feared giving out their credit card information because they did not feel it would be protected. Security and Usability go a long way with eCommerce sites. Thanks for the post. In our business – http://www.alwaysriding.co.uk, we make use of a nice open source system called http://www.mailbeez.com, which allows us to send loyal customers personalised email offers after a certain number of orders – certainly helps us to reward loyalty, and our customers seem to really appreciate it.